Meet Matthew Cardiff, a bright, young science student from the UK. Like most young adults, he is into music, football, and online gaming. Unlike his peers however, Matthew is on a health mission – To live well into his 100s and beyond! Matthew got off to an early start at age 17 and for the past 6 years, has been following the CRON-Diet to stay healthy, boost his immune system and to ensure his longevity. ‘The Calorie Restriction with Optimum Nutrition (CRON) Diet’ involves calorie restriction towards improving health and retarding the aging process while still attempting to supply the recommended daily amounts of various nutrients that the body needs. To my mind this is a must-read book for anybody who cares about themselves and their future. An outstanding panel of authors brings their expertise to the audience in 23 chapters of what I’m sure is terrific reading. Take a look at the table of contents below and you’ll understand what I’m talking about. Just as the health costs of aging threaten to bankrupt developed countries, this book makes the scientific case that a biological “bailout” could be on the way, and that human aging can be different in the future than it is today. 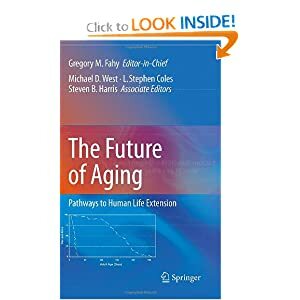 Here 40 authors argue how our improving understanding of the biology of aging and selected technologies should enable the successful use of many different and complementary methods for ameliorating aging, and why such interventions are appropriate based on our current historical, anthropological, philosophical, ethical, evolutionary, and biological context. Deep inside the inner-workings of our bodies, our cells are constantly being destroyed and recycled. According to scientific research, it is this ability to self-destruct and reprocess that paradoxically, may actually help us live longer lives. Within our cells, there are two kinds of specialized sub-units that behave like recycling mechanisms: Proteasomes and Lysosomes. Acting like a resourceful recycling service, these organelles break up waste materials and cellular debris and reuse and rebuild from that waste in essence, recreating new molecules from old parts. According to Dr. Ana Maria Cuervo, a leading scientific authority in the field of molecular biology at Albert Einstein College of Medicine, this self-destruction and recycling process is essential for our survival and in many different ways. Unfortunately, as we get older, our cells lose their cannibalistic prowess (scientifically termed as ‘autophagy’) and this decline may contribute to several characteristics and pathologies associated with aging. Unable to clear away the cellular garbage, our bodies start to fail. If this hypothesis turns out to be right, then it may be possible to slow the aging process by raising autophagy. The goal of Dr. Cuervo and her lab is to identify defect(s) that lead to decreased activity of autophagy with age, and to analyze if the correction of those defects and recovery of normal activity in old cells leads to an improvement in cellular function. Read more about the role of autophagy in aging. The SENS Foundation, a charity dedicated to accelerating the development of rejuvenation biotechnology was given the opportunity recently to fund a research project towards therapies in the Genetic Amyloidosis field. More specifically, the project will focus on therapies for ‘Senile’ or ‘Age-Related’ Systemic Amyloidosis (SSA) caused by aggregated wild-type ‘transthyretin’ (TTR), and isolated atrial amyloidosis (IAA), caused by aggregated atrial natriureptide (ANP). These cardiac amyloidoses are poised to become a widespread medical problem for the global aging population. The deposits of abnormal protein or transthyretin affect the heart tissue, resulting in decreased heart function and deterioration. The prevalence of cardiac amyloidoses is shocking among the elderly and instances of this disorder are rising rapidly. Cases are now beginning to increase among the “Baby Boomer” generation in the United States and the incidence and severity of the disease will certainly rise further as this group ages. ‘telomeres’: the specialized repetitive DNA sequences at the ends of the linear chromosomes, and associated proteins, that serve to maintain the integrity of the chromosomes. “The key message in this study is that in individuals taking the novel telomerase activator supplement, after a one-year period, there was a reduction in production of cells with short telomeres,” says study author Calvin Harley, CEO of Telome Health Inc., in Menlo Park, California, who says the study is funded by the product’s maker, TA Sciences. “The basic principle they put forward is if you activate telomerase — an enzyme — you’ll have more telomeres and have longer function by protecting chromosomes”, says John Pascal, assistant professor of biochemistry and molecular biology at Thomas Jefferson University. Pascal says telomere maintenance and research is certainly a valid area of scientific study. “It’s definitely a very pertinent topic because it seems to play a role in regulating how long the cell can continue to replicate and function normally,” Pascal says. I believe these results are a great illustration that there’s already something that can be done to get rid of harmful aged cells. In this case TA-65 ‘works against’ toxic senescent T cells that have short telomeres. Hopefully more research will shed light on the ways to solve the problem of cellular aging in all tissues. New research that looks at aging in baker’s yeast suggests that proper packaging of DNA can halt aging and lead to a longer life. Jessica Tyler molecular biologist at the University of Texas MD Anderson Cancer Center in Houston and her colleagues think they have uncovered yet another way cells age – by losing histones – The important proteins that form a spool upon which DNA is wound. Tight winding keeps genes off, while loosening the packaging allows genes to be turned on. Just like a bread box or tightly sealed plastic bag can help keep a loaf of bread stay fresh longer, Jessica Tyler’s research looked at aging in baker’s yeast and the study suggests that proper packaging of DNA is a key to cellular longevity. The research details a noticeable decline in levels of DNA-packaging proteins – histones – which is partially responsible for aging, and that making more of these proteins can extend the lifespan of yeast. “The next burning question is, ‘Are any of these mechanisms at play in the mammalian system?’” Kaeberlein says. Some evidence suggests that mice also lose histones as they age. Read original article about cellular longevity.